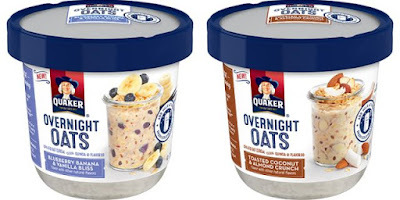 Quaker aims to add convenience to overnight oats with the launch of new Quaker Overnight Oats, which are single-serve cups of flavored oats. Overnight oats, which is oats soaked overnight in milk (or dairy alternatives) and/or yogurt (plus any toppings you want to add), have become popular in recent years as a convenient breakfast for those in a hurry. To prepare the single-serve cups, you just add the liquid of your choice the night before. The 2.43-oz cups sell for around $1.50 (may vary).